Partial Accomplishment Of Goal - Ramblings of Mad Shutterbug & the Border Collie Bros.
You'll probably need to follow the link to see the LOL best. I mean, I object to this flagrant goat abuse! What abuse? I turned her loose from teh fence. *G* After I took her picture. Did you see the LOLCow? 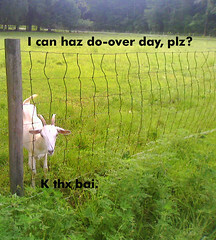 Or the LOLGoat? Squrrl? Actually, all three of them have great faces. Squrrl is our resident Blonde, as in A Way of Being, not a complexion/hair colour. 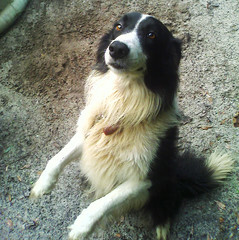 He revealed this character trait the day he spent 30 minutes trying to herd a goat which had died of old age overnight. I am not a Blonde, MsMactavish, and I do not know why my brothers and Boss keep saying that. That goat just, like, would not get up when everyone else was all up and going to barn. That's the simple response. Like cats too, but cats are cats. I mean, not even apples/oranges comparison. One of your countrymates makes similar comments about Squrrl; she's missing having a dog just now too, but isn't at a spot yet where having one is good for all. Lots of other time commitments for a bit. We toss back and forth the concept of me sending Squrrl to her every now and then. Don't think I seriously would, that's a long trip for a dog, unaccompanied. Houdini and I were having a race, on like how many people looked at our portraits, and I SO won! I pwned him!